Suppocire® and Ovucire™ are our well-established brands of semi-synthetic hard fat bases comprising fatty acid esters. 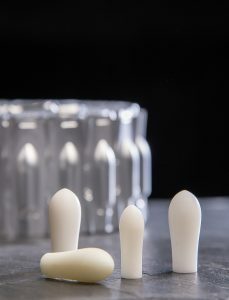 Their physicochemical properties have been optimized to provide excellent drug delivery for both solid and liquid active pharmaceutical ingredients (APIs), across the range of water solubility. obtain excellent product quality attributes including drug dissolution, i.e., efficacy. These multipurpose vehicles span a range of melting points and hydroxyl values and are suitable for a wide spectrum of APIs. They are ideal for straightforward formulations using manual, semi-automated, or fully automated equipment. laboratory-scale formulation development, troubleshooting, scale-up, and manufacturing advice. Contact Gattefossé to obtain reference formulations with APIs such as acetaminophen, clotrimazole, diclofenac sodium, econazole nitrate, hydrocortisone acetate, ketoprofen, lidocaine hydrochloride, mesalamine, metronidazole, miconazole nitrate, nystatin, papaverine, phloroglucinol, piroxicam, probiotics, procaine, progesterone, and ruscogenin in association with trimebutine. 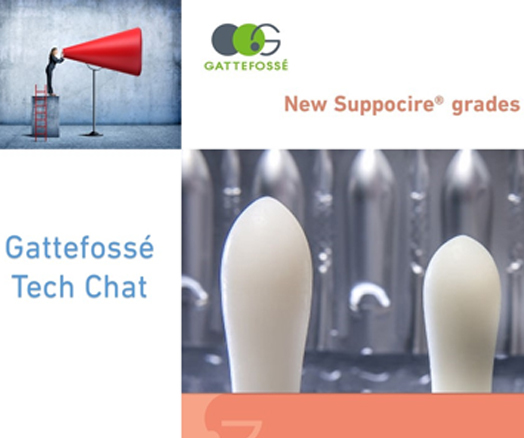 Gattefossé - New Suppocire® grades for flexibility and high performance.